Thank you for joining me today…back soon with more! Simply gorgeous tag, beautifully photographed too. Love the colours & agree that Art is Life. Lee-Anne, this is awesome. I just sat and looked at it for a while and took it all in…so many wonderful details, stamps, and colors. Wow, what a beautiful tag !!!! Great job! Wowza! A stunning tag Lee-Anne!! You have mastered the TH look perfectly! Love the colors and all the fabby details! Have a marvelous day! Awesome Tag…and those colors – just perfect! I think Blogger ate my comment last night. I love the colours you've used, the greens are lovely. But what is Hug Snug? I have never heard of it and it sounds useful! Thanks for getting back to me re Hug Snug – I appreciate it. Love it Lee-Anne. Love the delicacy you have achieved. This technique lends itself to a variety of styles and looks. This month I see several tags that are good but few that are great. Yours is great. 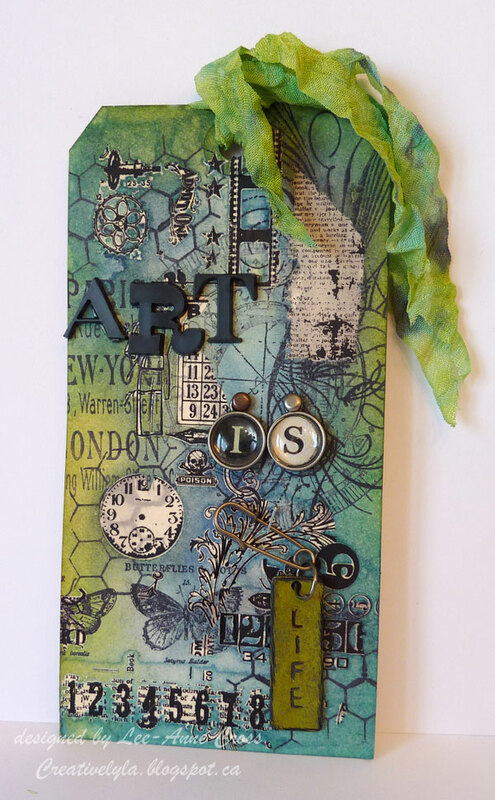 Love everythhig- your color palate, the images you used in the rub ons as well as the stamps and the 3D embellishment. Everything is there for a reason- one of my peeves is adding crap just to add crap and no real reason for it to be there. Awesome tag. Lovely tag! I like the composition and love the color combo. I also purchased a whole roll of Hug Snug – since it is the only “ribbon” I use anymore.